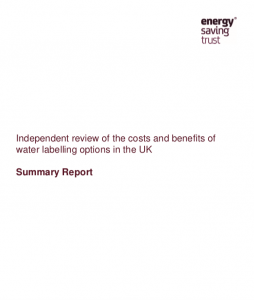 Summary of the Independent review of the costs and benefits of water labelling options in the UK. This report was funded by the Water Company Collaborative Water Efficiency Fund. 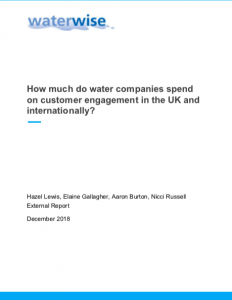 How much do water companies spend on customer engagement in the UK and internationally? Several UK water companies, along with the economic regulator (Ofwat) have identified the necessity to move towards proactive customer engagement, with a particular focus on achieving large scale water use reduction. As a result of climate change and the expanding population, improved water efficiency is an increasingly important global issue. However, to date there is a lack of suitable research in this area. 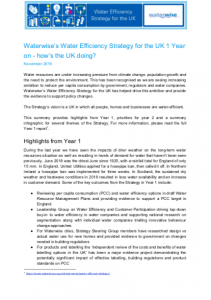 Waterwise aimed to address a portion of this gap in knowledge through an exploratory survey, predominantly focusing on spending by water utilities in the UK, Europe, USA and Australia on their customer communications and marketing on water efficiency. This research also aimed to compare and contrast company spend on engagement relative to their levels of water efficiency. This report sets out, for each theme of the Strategy: Progress against actions in Year 1; and Priorities for Year 2. It also sets out a conclusion and next steps. 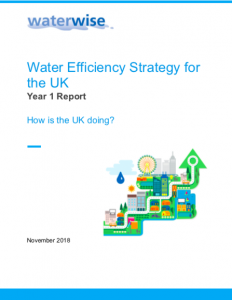 We have seen increasing support for water efficiency from government and regulators during the development of the Water Efficiency Strategy for the UK and since. In preparing the Year 1 report for the Strategy we decided it was timely to summarise some of the key policy developments on water efficiency. This is also timely before the UK Government’s full response to the National Infrastructure Commission’s National Infrastructure Assessment, which includes recommendations on metering and water efficiency, as well as the UK Government’s report to Parliament on water conservation as required every three years under the Water Act 2003. Waterwise worked with the Water Efficiency Strategy for the UK Steering Group to develop an evidence briefing on water efficient new homes in England.